FVWM, (see also related wikipedia entry) is an historic, mature, extremely powerful and configurable (and relatively hard to master) window manager for X. The modern FVWM 2.x branch which you can find in most distributions' repos, diverges significantly from the 1.x line, which was forked from OpenBSD long ago and can still found in its base alongside cwm; therefore the configuration below would require a massive reshape in order to adapt to OBSD's native FVWM (fvwm2 is found in OBSD's ports too). 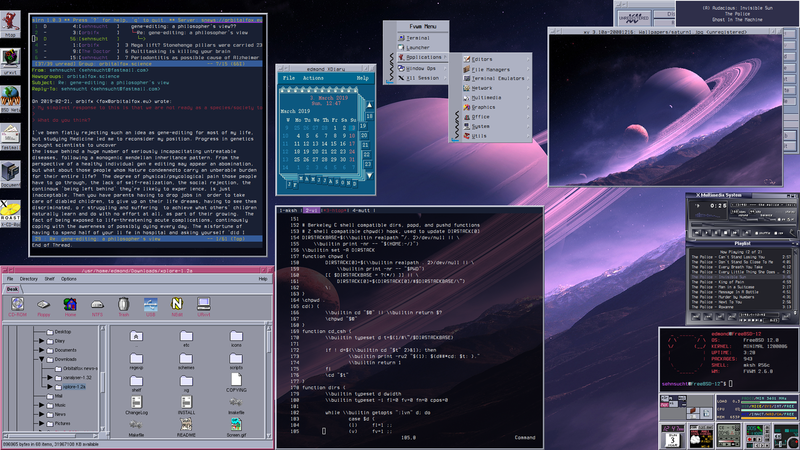 I discovered FVWM a couple of years ago thanks to ILUXA's post on FreeBSD Forums and it raised my curiosity. At first it looked 'hostile' at best, configs available online were often outdated, hard to understand without a background knowledge, while the excellent official fvwm documentation was too extensive to be grasped at once. As I kept retrying on and off with no particular dedication, reading mans and still screwing up my config, I found myself having an intermediate understanding of its inner and design within a couple of months. Since then, FVWM has become my favourite window manager together with IceWM and Fluxbox. So why FVWM? FVWM basically allows the user to build his/her own lightweight DE (with ICCCM and EWMH compliance) without having to actually write one, by providing a high-level abstraction for all common WM aspects, features and behaviour. The Function + Bindings system lets you control almost every single aspect of window management, decoration are completely hackable (it's quite easy to reproduce any wm theme) and several modules (FvwmPager, FvwmButtons, FvwmTaskBar, FvwmAnimate, FvwmEvent...) allows creating docks, panels, wokspace manager, icons, animations, launchers, setting wallpaper, as well as toggle transparency and control WM events. This modularity is also the key of FVWM lightweight: users enables only what it's defined in the config. On the other hand, the default FVWM config is extremely barebones, oldish and anti-intuitive. This was enough to drive most users away in early '00s (same fate as AfterStep), no sooner had GTK+ DEs become stable. Below my personal lightweight FVWM config , which uses built-in Mwm style emulation, with, again, my beloved CDE Solaris crymson+dimgrey color scheme, a single FvwmButtons Dock and FvwmPager. The Functions are designed to reproduce most common features and the functionalities of popular WMs (stacking, opaque moving, floating, tiling, dynamic focus change, any-border resize, iconify/maximize, fullscreen, alt-tab switch, window-grab ops, keyboard accelerators, move/go-to workspaces, etc...) . Some Icons/pixmaps come from those already shipped with FVWM, some others from WindowMaker and GNUStep, but I created several more too, all available here https://svn.riouxsvn.com/sehnsucht_dots/fvwm/pixmaps/. # Ctrl + Arrow scrolls by 1 page. # Alt + Arrow scrolls by 1/10 of a page. # Shift-Control + Arrow moves the pointer by 1% of a page. # Shift-Alt + Arrow moves the pointer by 1/10 of a page. Style *   Font "xft:Terminus\ (TTF):medium:antialias=true:size=10"
Style * IconFont "xft:Terminus\ (TTF):medium:antialias=true:size=9"
In case you wanted to venture yourselves in the awesomeness FVWM, keep in mind there are official FVWM Forum (https://fvwmforums.org/phpBB3/) and mailing list available to ask for help.